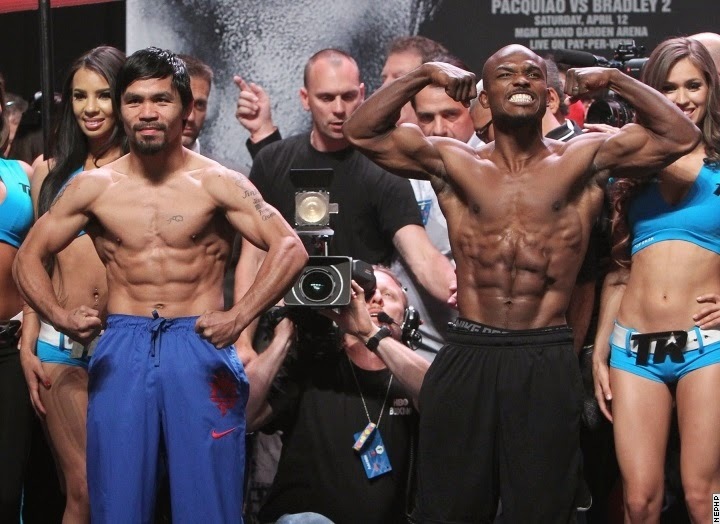 Pacquiao-Bradley 2 weigh-in (Results, Video, Photos) - Balita Boss! The former eight-division champion Manny Pacquiao and undefeated WBO World Welterweight champion Timothy Bradley Jr. step on scale for the official weigh-in for their highly anticipated rematch at the MGM Grand Garden Arena in Las Vegas, Nevada. Bradley earned a split decision victory on their first fight but most ringside observers thought that Pacquiao won the fight. Pacquiao wants to avenge his controversial loss two years ago, while Bradley is out to prove in world of boxing that he deserves the title he seized. Pacquiao, with a record of with a record of 55-5-2, including 38 knockouts, tipped the scales at 145 pounds. Bradley, with a record of 31-0 and 12 knockouts, weighed in at 145.5 pounds.